Ever since the latter half of the 19th century, these tracks have comprised one of the vital rail links in the eastern United States. The Pennsylvania Railroads mainline between New York City and Chicago has always been a part of Bellwood-Antis life and will no doubt continue to be. 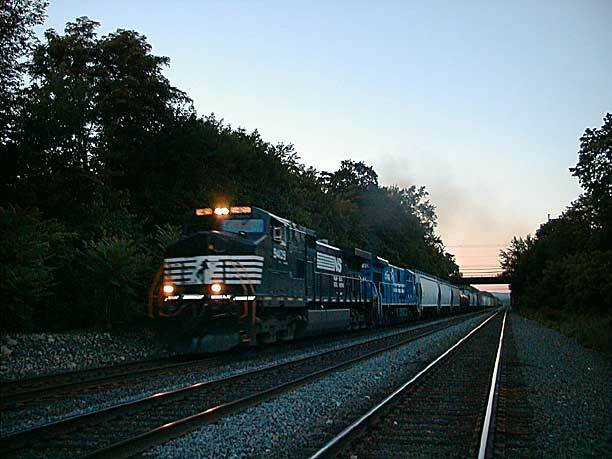 Nowadays Norfolk Southerns black and white livery run the rails through the region, as demonstrated on this summer evening by this westbound freight heading for Altoona and the famous Horseshoe Curve. The second locomotive is a yet-to-be-repainted Conrail unit, recently adopted by NS in their purchase of the eastern rail giant. The only link between the north and south sides of town, the Bridge Hill, is visible in the distance.